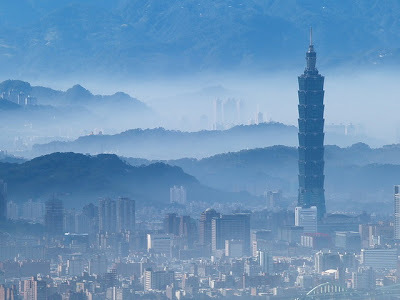 With a massive 60-foot spire inspired by Twaiwan's native bamboo plant, Taipei 101 Tower is one of the tallest buildings in the world. At 508 meters (1,667 feet) high, the tower and its spire outrank the Petronas Twin Towers in Kuala Lumpur, Malaysia. 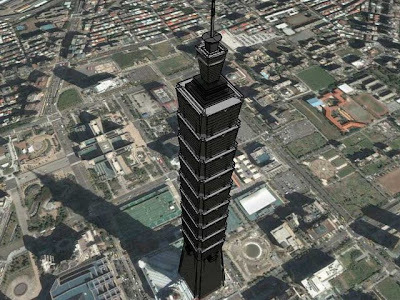 Taipei Tower has 198,347 m2 (2,336,000 sq. ft.) of office space, 77,033 m2 (796,000 sq. ft.) of retail space, and 83,000 m2 (893,000 sq. ft.) of parking space for more than 1,800 vehicles. Designing a building this large presented unique challenges because Twaiwan is subject to typhoons and earthquakes. To counter movement, a tuned mass damper system has been incorporated into the structure. The 800-metric ton (1,764,000 lbs. ), spherical steel mass is located on level 88 and will be visible from the restaurant and observation decks. The system transfers the energy from the building to the swinging sphere, providing a stabilizing force. 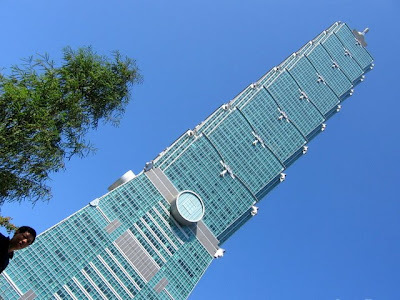 The design of Taipei 101 borrows heavily from Chinese culture. Both the building’s interior and exterior incorporate the Chinese pagoda form and the shape of bamboo flowers. The lucky number eight, which means blooming or success, is represented by the eight clearly delineated exterior sections of the building.